Give 'er the eyes lads, oi oi! Unless you've done all the incongruous marriage stuff, the only ending open to you without giving her the eyes is the most boring one. I gave 'em to her (wahey) on my first playthrough and it felt like the "right" ending to me. So this is interesting and I now wish that the mound makers covenant actually worked like this without glitching. Being a moundy was probably my favorite part of 3. Loved getting summoned to carefully orchestrated arenas and then going mad. I was once summoned and helped a lad all the way up to a boss fight, but obvs couldn't pass through the mist with him. Which was a shame, the big hat lad was crying out for my help.
. I got so competant at beating them that I was almost doing them single-handedly at times. I got a lot of thankyou messages from randos I assisted - what the hell other game is going to get PSNers to do that!? for me. After her, the multiplayer started cocking up for me and I didn't really get to summon/ be summoned for the rest of the game. it really was some sight. be a moundy-dude; but I've enough to worry about as is! I know I'm doing it wrong, keeping out of the multiplayer, but that's for the same reason I avoid online shooters; I didn't start on day one, and therefore everyone has a better idea of what's going on than me. went back through the mist to the two princes (just go ahead now - am I right in thinking you've done that joke 100 times already?). Not quite sorted them yet, despite help from our badly-voice acted lady there. Want time - And actually I'm going to say something negative about Dark Souls here - I know it's supposed to be a bit mysterious, and you're supposed to find out the lore (which I really do like; finding out the story at your own pace is better than having to dart between 30 minute cut-scenes in other games), but, as mentioned elsewhere, it's very guilty of "monkey-pawing"; you're given a vague bit of dialogue, and one chance to make a "yes or no" choice; when really, there should be a "could you explain a bit more clearly what my options are" option in most cases. DS3 seems to be guilty of that much more than the previous entries. Dark Souls III is weird compared to the test of the series, lore wise. What's there is much easier to find and put together than in previous games but there seem to be less answers to find. A lot of stuff is just left vague, whereas in the original it was subtly told but it was all there if you looked. Do you think the unresolved story elements mean that there'll be a Dark Souls IV? I really, really hope not. The story was satisfyingly wrapped up in Dark Souls. Dark Souls II was an interesting exploration of smaller stories within that same cosmology. Dark Souls III tries to be an ending to that cosmology, and in those aspects is very obvious and predictable. On the other hand, it also introduces new smaller stories and characters and factions, and its these which are not explored to my satisfaction. If we did get a Dark Souls IV, in keeping with the series so far it wouldn't really explore these aspects anyway. As it is, though, although III was very enjoyable to play, most of the world felt like things we've seen before, and the story didn't have the very personal artistic touch or the smart characterisation and storytelling. I'd much prefer to see the series left alone and see the developers put their energy into something new and original. Just beat Artorias. Got to go to work in like two minutes. It was exactly as brilliant as everyone says. I think this now means there is only one boss to go until I've pretty much beaten every bit of Dark Souls that there is to beat. Nah, there's no such thing as doing it wrong in fact apart from a couple of coop summons I stayed well clear of it in DaS as I just didn't think it was fun. I thought the multiplayer elements of DaS were immensely irritating. I found health maintenance and the plodding pace of combat in general stressful enough without some edgelord coming over here and taking my souls. Playing on Steam I don't think I ever got invaded, but I beat the game a second (and third, God knows why) time with for a mate on 360, and Anor Londo invasions started taking the piss. I was happier with 3's probably because I found the combat much more fluid, but also because it was much easier to find most of the guilds and stuff early on. I dunno. Maybe I just found the stakes in 3 much lower than in 1 because of how you can warp between bonfires, and how the game is more linear, and so that was enough to coax me into engaging in a little PvP. That said, there were still times I turned my internet off because the invasions were getting a little out of hand in areas I just wanted to focus on getting through. The lag was also atrocious in DaS as well, god knows how many times I rubber banded into being back stabbed after thinking I'd made an escape. I'd say yer bang on about all of that especially the combat part - before the game came out I loved the comparisons to Bloodborne as I absolutely loved the pvp in that game just a shame it was limited to certain areas/situations. Got to Manus in the DLC and decided he was a bit hard. Beat Manus, wrapped up the DLC. Killed Gwyn, got the dark lord ending and watched the end credits. I can't think of another game I've completed this exhaustively twice and been itching to return to. I know one day I'll do a Onebro run, but I'm gonna give it a rest for now. (That said, I'll still be voraciously consuming podcasts and videos and articles and books and artworks and anything else). But it's good to have played every little bit of content now, so I can look forward to the Switch and other games and know I'll actually play them instead of just more Dark Souls! 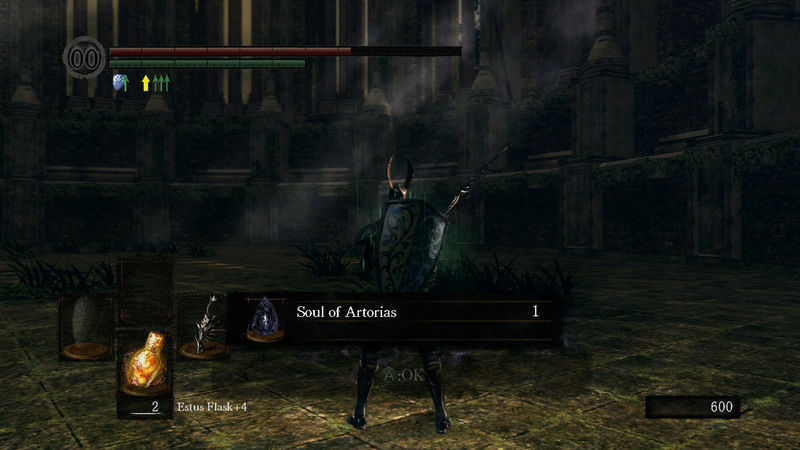 Artorias of the Abyss is great by the way, get it played lads. Anyway. Yeah.Dark Souls. Solid 7/10. If you haven't already, I recommend checking out EpicNameBro's "From the Dark" playthrough - it's the most extensive playthrough I've ever watched, and covers what feels like literally everything in Dark Souls. You'll be itching to experience it again for yourself after watching. You'll be itching to experience it again for yourself after watching. That's the last thing I need! I killed the Nameless King of Archdragon Peak (probably Tony) with gratuitous crossbow and running away. Cheesing, basically. That's also how I did Smough in, come to think of it. Time to hand in my Dark Souls card. Just the final boss to go! Once I'm done, I'll probably watch that From the Dark series; I've never actually watched anyone else play the original. The Nameless King is probably the hardest fight in the series; took me many an evening before I finally beat him mano e mano with a big ol' sword. Yeah, I do feel a bit bad. The end boss did a "ha ha I have 2 health bars" thing... but actually working out that you just stay away from him and get a stab in when he decides to jump for you, I think I didn't use any Estus on the final go. I still don't know whether I did the "right" ending or not. I gave 'keeps the eyes; she said "I've seen a world without flame - do you want that? "; I said "uh, that sounds bad I think"; she said "I'm-a go crazy! Kill me"; I ignored that; I summoned her instead of touching the last bonfire; she got rid of the fire, but said eventually there will be a little new one... I think that's the end? I'm waiting a bit before Bloodborne. I thought I'd aced the game; however I still clocked in 68 hours. One day I'll go back and try and play with a magic person; so far, from one to three I've been Fat Tank, I Don't Know What I'm Doing and Super Leapy Assassin. That's the ending most of us went through. I've got another save file sat half way through a run to the complex Londor ending but I'm a bit soulsed out for the time being. Oh, I saw there was an ending that looked like one of those "how to play as Luigi in Mario 64" rumours. I'll watch someone do it on YouTube, thanks! The Londor ending is mental, but probably the most interesting ending. Worth looking it up, at least.